SolarWorld Sunmodule Plus 250 mono black 250 Watt Solar Panel Module – this is an independent review for SolarWorld Sunmodule Plus 250 mono black 250 Watt Solar Panel Module we have compiled for your reference. Feel free to add your comments or experiences at the bottom of the page. SolarWorld Sunmodule Plus 250 mono black 250 Watt Solar Panel Module heralds an innovative new module concept from SolarWorld. The Plus-sort (based on a SolarWorld flash report) and five watt model stepping ensures true, highest system efficiency and dispenses with the time-consuming task of sorting the modules on site. The fully automated production process at the SolarWorld factories creates a module quality that is consistently high, which in turn will ensure high yields for the long term. The graph below shows the typical power produced (in Watts) for the SolarWorld Sunmodule Plus 250 mono black 250 Watt solar panel module at maximum available sunlight (irradiance). The SolarWorld Sunmodule Plus 250 mono black 250 Watt solar panel module has a maximum output of 250 watts. 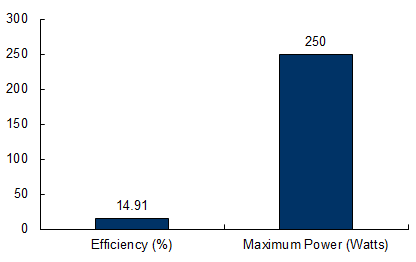 The graph below also shows the efficiency of SolarWorld Sunmodule Plus 250 mono black 250 Watt solar panel module. Efficiency is an important thing to look at when comparing solar panels, since it affects how much power can be captured from the sun. The SolarWorld Sunmodule Plus 250 mono black 250 Watt solar panel module has a module efficiency of 14.91%. Size is an important thing to look at when comparing solar panels, since it effects how much power can be captured from the Sun, and explains how many panels will be required to meet your need. This solar panel has a panel size of 1.68 metres squared. If you are thinking of buying a SolarWorld Sunmodule Plus 250 mono black 250 Watt Solar Panel Module, we'd advise measuring your solar resource first. Doing this will give you a much better idea of how much power you might generate. Click the button below to add the SolarWorld Sunmodule Plus 250 mono black 250 Watt Solar Panel Module (Discontinued) to your wish list.